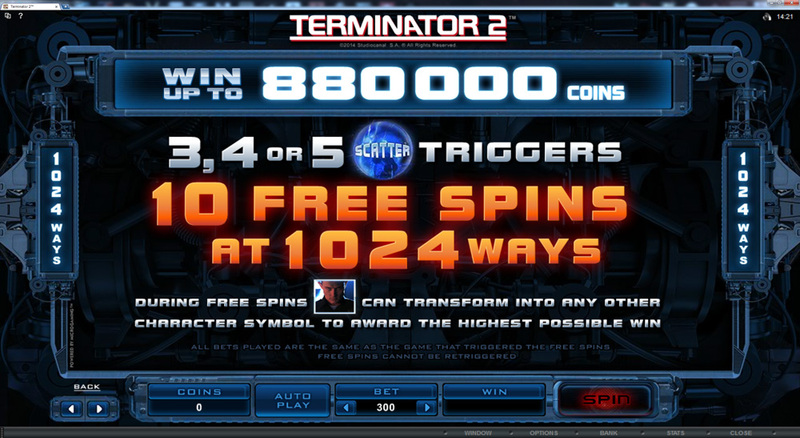 Terminator 2 is a new online slot, released on June 4th 2014 by Microgaming. This new slot features 243 ways to win, wild symbols, a bonus feature, and a unique free spins feature. Coin sizes range from 1 cent to 50 cents, and you can bet up to 10 coins per spin. This gives you a very large range of bets, from as low as 30 cents per spin all the way up to $150 per spin, so it should suit any style of play. I would call Terminator 2 a low to mid variance slot, which will give you many smaller wins and large wins will be more rare. I found that the lower paying symbols lined up quite often for 5 of a kind wins, even without the help of wild symbols. This type of slot can keep you playing for quite a while, but don’t expect it to make you rich in one spin. 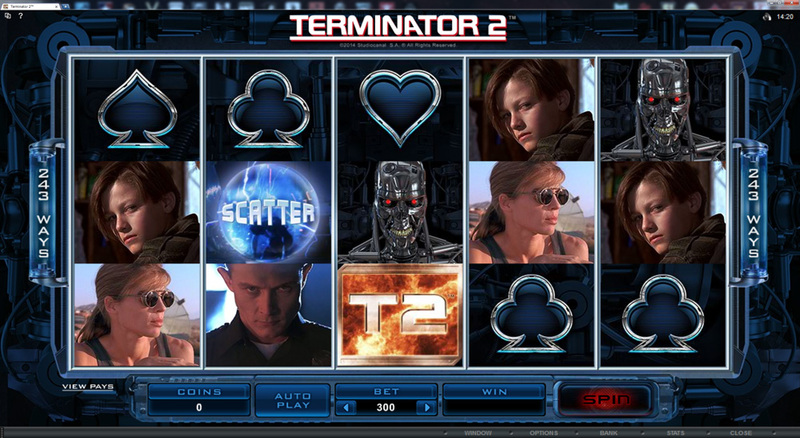 The theme of this slot is obviously the Terminator 2 movie, with the main characters from the movie being the higher paying symbols. The Free Spins Feature is triggered when 3 or more scatter symbols land on the reels during a single spin. What makes this free spins feature unique, is that all the reels stretch up to add another spot and makes it a 4×5 1024-way slot. You are awarded 10 free spins, which cannot be re-triggered. During these free spins, the T-1000 symbol can transform into any other character symbol, in a way that awards you the highest possible win. Play Terminator 2 now at 32Red Casino! 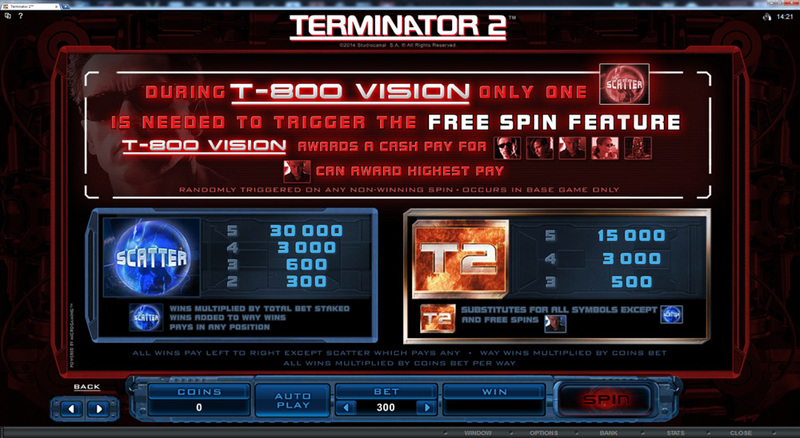 The T-800 Vision Feature is triggered randomly at the end of any non-winning spin. This feature gives you a cash prize for every movie character symbol that’s on the reels, with the T-1000 symbol awarding the largest wins. If there is only one scatter symbol on the reels when this feature is triggered, it will trigger the free spins feature. There are also achievements to unlock, much like Thunderstruck II (which was the first Microgaming slot to have this feature). When you line up three, four, and five of a symbol at least once, it will tell you that you’ve unlocked an achievement. Once you’ve done that for all available symbols, those symbols will change on the reels. I really like the movie, so it was pretty easy to like this slot. So far it’s been quite a bit better to me than some of the other recent releases from Microgaming have. The free spins feature has potential for some very large wins, if you can get enough T-1000’s on the reels, and I like how it morphs into a 1024 way slot. You can play Terminator 2 at any of these trusted Microgaming Casinos.